A stunning smile is quite possibly the most attractive feature of your face. It draws people in, encouraging them to know you better, and it opens countless doors in your personal and professional life. Yet nature, genetics, and active lives don’t grant flawless smiles to everyone. Dr. Vickii Bingham-Lester can help. She gives men and women in Crofton, MD and surrounding areas the smiles of their dreams. It’s not magic – it is a combination of technical skill and natural artistry. Please don’t be intimidated by the idea of cosmetic dentistry. It is not vain to want to look your best, and you don’t need a movie star’s bank account to improve your smile. Just schedule a consultation with Dr. Bingham-Lester to find out how she can design a smile makeover just for you. It may be simple, one-time treatment to correct a flaw that bothers you, or it could be a more comprehensive plan, phased in over time to fit your budget and schedule. Teeth whitening – A single, fast, in-office whitening session, or gradual brightening with nightly KöR® Deep Bleaching System treatments – the choice is yours. Either way, your smile will pop with radiance. Tooth colored fillings – Why show the world that you’ve had a cavity? Durable composite resin fillings blend with your natural dentition. An increasing number of patients are having old “silver” amalgam fillings replaced with this beautiful alternative. Bonding – An economical method to disguise imperfections and close small gaps. 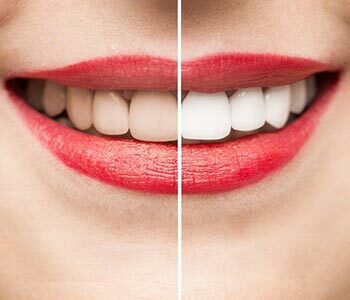 Veneers – These luminous porcelain shells cover resistant discoloration, cracks, chips, and other enamel imperfections, as well as improve the appearance of tooth shape or alignment. Crowns – With CEREC® technology in-house, Dr. Bingham-Lester can design, fabricate, glaze, and place lovely ceramic dental crowns, in just one visit. From teeth whitening to a comprehensive smile makeover, your look is in experienced hands at Bingham-Lester Dentistry. Bridges – There is no need to let a missing tooth mar your smile. A dental bridge closes the gap nicely. Dental implants – A dental implant replaces a missing tooth with one that looks and feels so natural, you may forget which tooth is the implant. Dentures – A great-fitting set of custom dentures adds facial volume and melts years from your smile. 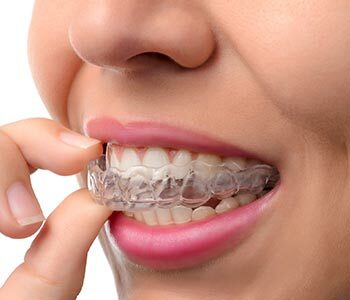 Invisalign® – Look good while you get a straight, even smile with Invisalign® clear braces. Dr. Bingham-Lester understands that dental anxiety keeps many individuals from pursuing cosmetic dentistry. She offers the options of nitrous oxide and oral conscious sedation so that you can relax before and during treatment. The maintenance of clean teeth and gums revolves around brushing and flossing. Place the toothbrush bristles next to the gum line on the outer surfaces of the teeth. Brush gently, using a back and forth technique with the toothbrush. For the inner surface of the teeth, place the bristles next to the gum line and brush in a circular motion. The inside of the mouth is where the most plaque accumulates. Brush the surface of the teeth where the chewing of food takes place in the same circular motion. To clean those places between the teeth where a toothbrush can’t reach, floss once a day to remove food and plaque before it can cause gum disease. So eat a well-balanced diet, brush twice daily, and schedule regular checkups with the dentist. This brief video is packed with information about maintaining a healthy mouth. For more information call Dr. Bingham-Lester at Bingham-Lester Dentistry. 410-885-6522. From teeth whitening to a comprehensive smile makeover, your look is in experienced hands at Bingham-Lester Dentistry. Call 410-885-6522 for a consultation with Dr. Bingham-Lester.